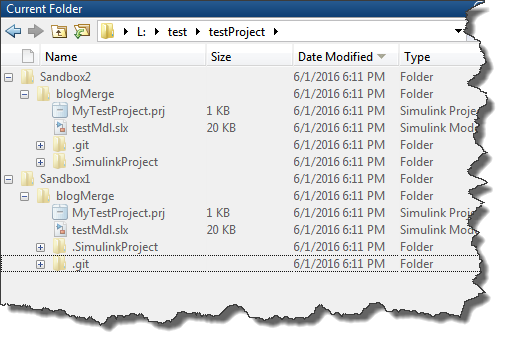 In those documentation pages, the workflow always begins with right-click on the conflicted model file and select View Conflicts. In this blog post, I will try to provide a bit of additional information to complement the workflow described in the above links. I close the first project, navigate to the second repository, open the Simulink Project there, and modify the model in a different way. Before trying to commit and push changes as done in the first repository, it is always a good idea to click the Fetch button to get the latest from the remote repository. 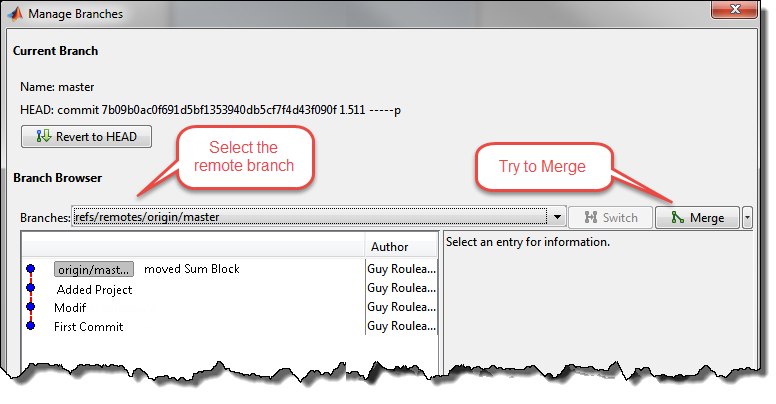 Once this is done, you can see if the remote master branch has new submissions. If it does, you want to merge with it before pushing your changes. A target model automatically generated by Simulink, attempting to do its best guess at merging the three previous models. 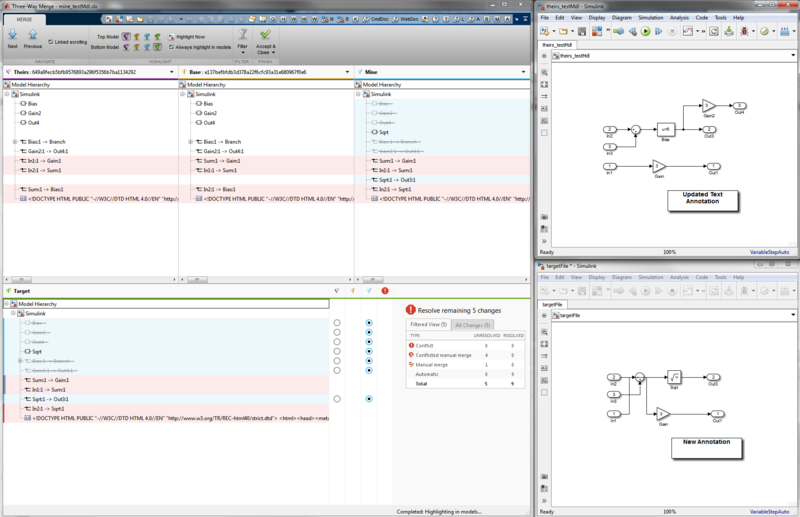 In the bottom left section of the Three -Way Model Merge, for each block and signal, you can select which version you want to be merged in the target model. 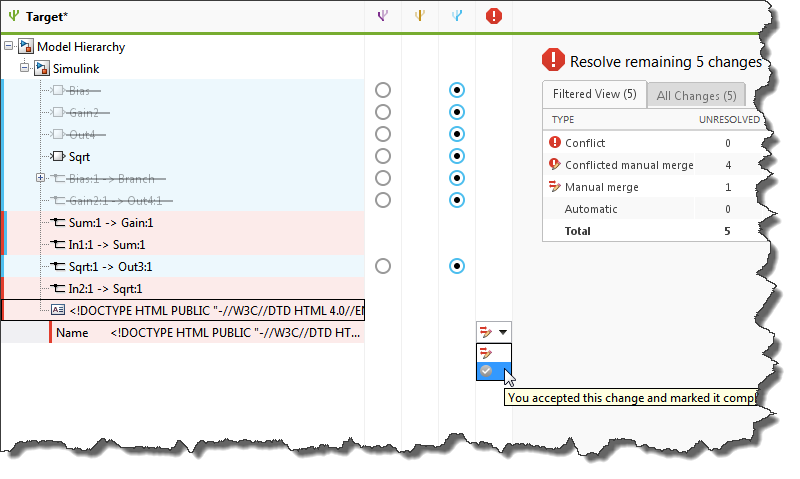 For conflicts that cannot be automatically merged, you can manually fix them in the target model and individually mark them as resolved. Since the versions from repository 1, repository 2 and the target model can all be opened at the same time, this makes the manual resolution of conflicts quite easy. 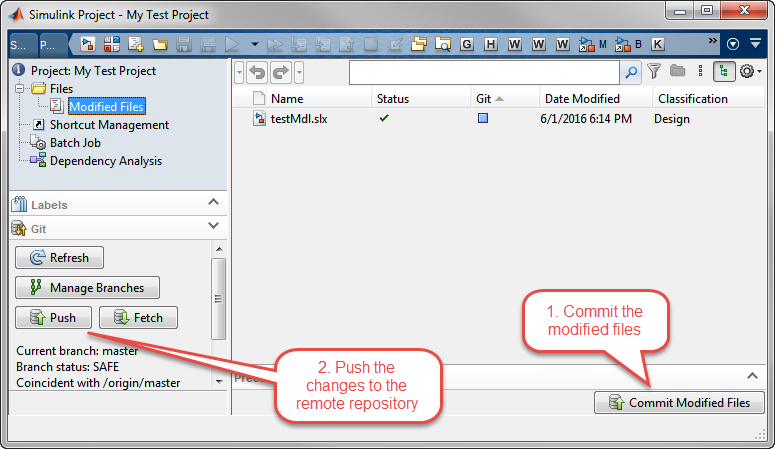 You will then be able to Commit the modified files and push the changes to the repository. If you click the Manage Branches button, you should see how the project got branched and merged back. where the 4 inputs are four model files. How do you manage branching? Give a try at the Three-Way Model Merge and let us know what you think by leaving a comment here. Did you ever try a serious merge of productive code? 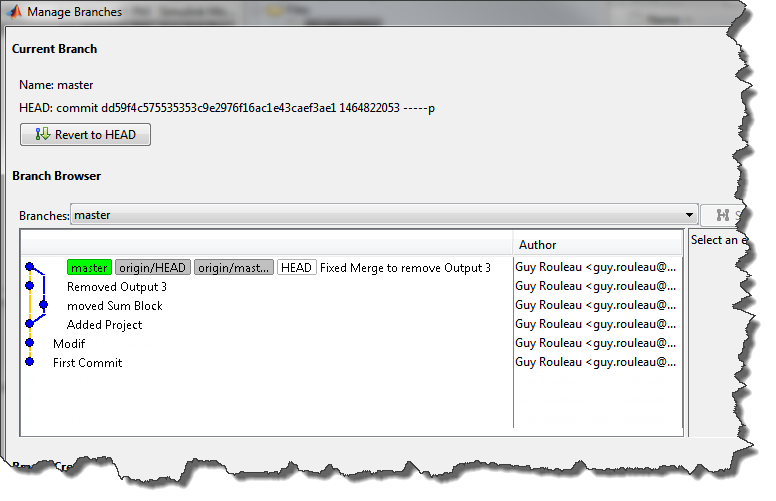 - Merging some converted mdl to slx files results in unspecified errors without comment. - The filter is still not configurable, it is unknown what the predefined filter actually filters - Changing a subsystem name, that you want to compare, results in a fantastilion number of merge conflicts - Selecting a version to solve a conflict and changing it's mind afterwards for a different version results often in an error, as the merge can not be undone. The software does not know what to do. It works fine, if you change a few parameters and names are untouched for small models. @Przemyslaw: I agree that the merge feature is not ideal. We are working on improving it. In my opinion, the greatest advantage of the 3-way model merge is how, when working within source control, it can show you the three models "base", "theirs", and "yours". Without this feature, we had to manually copy and rename all those. Hi there I am so grateful I found your weblog, I really found you by error, while I was researching on Bing for something else, Anyhow I am here now and would just like to say thanks for a remarkable post and a all round exciting blog (I also love the theme/design), I don't have time to look over it all at the minute but I have bookmarked it and also added in your RSS feeds, so when I have time I will be back to read much more, Please do keep up the superb work.